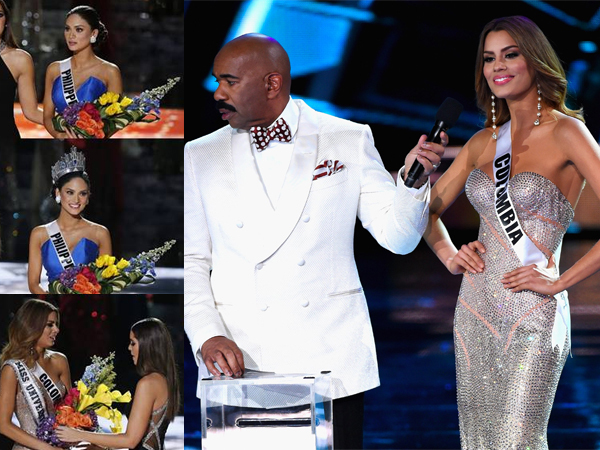 Miss Universe 2015 host Steve Harvey announces had to correct himself after announcing Ariadna Gutiérrez Arévalo from Colombia as the contest winner. Steve Harvey made sure whenever you mention the Miss Universe pageant, he will be remembered as the host who announced the wrong winner. The comedian who was hosting the show said it was just an “honest mistake” on Sunday. I wonder what it must feel like to be declared a winner, given your flowers, crown placed on your head and congratulated, then in a couple minutes told sorry it’s a mistake. It’s was almost like watch a movie in reverse. Miss Colombia, Ariadna Gutirrrez Arevalo, was the Miss Universe for a little over two minutes. The people of Colombia also shared in the celebrations, flags waving and everyone filled with joy. For that one shining moment everything was perfect, the country has manage to do a repeat. But then Steve Harvey found out that he had misread the cue card. “I have to apologize,” said Harvey amidst the cheering and noise. Harvey went on, “The First runner-up is Colombia,” creating a moment in history that will forever link his name to the Miss Universe pageant. In the midst of all the confusion, Pia Wurtzbach, Miss Philippines, looked on with a shocked look on her face as if she was in a trance or she was dreaming. Miss USA tried to reassure her somehow that it was for real. Then twitter and social media exploded with reactions to what took place. Here is how it all went down on Twitter.